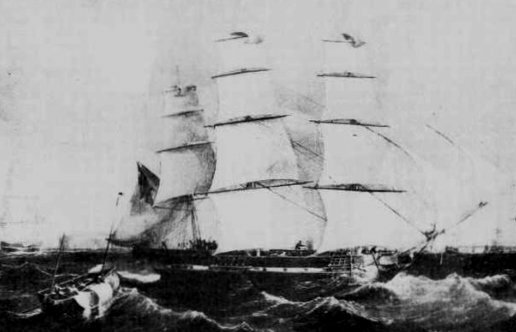 Lord Dalhousie was built at Sunderland in 1847. Brothers William and John Mowbray Gales established themselves as ship builders at South Hylton in the early 19th century. They both had sons to carry on the business and although Dalhousie would have been built by this family company, it would be difficult to identify who was ‘in charge’ at the time. 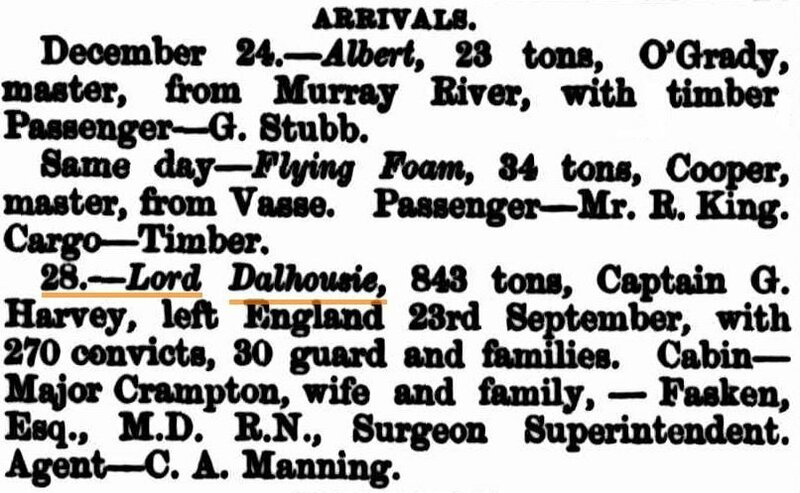 At the time of Dalhousie’s convict transportation contract, she was owned by the Liverpool shipping line T & J Harrison. Lord Dalhousie, Official No. 25223, 912 tons, length: 746.9 ft. breadth: 33.6 ft. depth: 23.7 ft and draft: 17.6 ft. was an early frigate with oak hull and three masts. 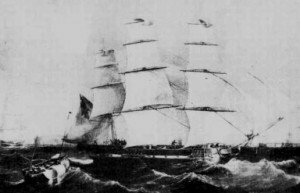 She was employed as a convict transport for Western Australia and left Portland on September 25, 1863 bound for the Swan River Colony. She carried the 29th of 37 shipments of male convicts. The voyage took 90 days and the ship arrived in Fremantle on December 28, 1863 with 270 convicts on board and a crew of 39. George Harvey and Dr Fasken were the captain and surgeon respectively. The religious instructor was Rev J Withers who would take up his chaplaincy in Bunbury. Of the 270 convicts on board, 41 had been sentenced by District Courts Martial for military offences. Two of them, Michael Harrichael and John Kenny, were veterans of the Crimean War. There were no deaths recorded on the voyage. Also on board were 30 pensioner guards, 21 wives and 35 children, as well as five wardens ready to take up appointments in Fremantle Prison. Five of the pensioner guards had seen action in the Crimean War. Another military man of some importance to the Colony was Captain Robert Henry Crampton; in due course Crampton would be appointed Commandant of the EPF after the death of Colonel John Bruce in 1870. Derrick Prall’s publication & Crew List Index Project. 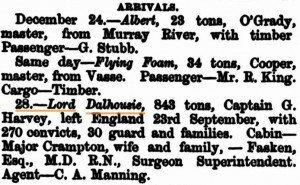 Convict Transportation Register HO11-18-298/300, National Archives Kew. West Australian Times 31 Dec 1863. Perth Gazette 1 Jan 1864. Inquirer & Commercial News 6 Jan 1864.